“There is already a robust marine shrimp market, but people don’t often know about freshwater prawns,” said Kauffman, whose home department in the Virginia Tech College of Agriculture and Life Sciences is the Department of Agricultural and Applied Economics. Working with the Virginia Aqua-Farmers Network, he has paired shrimp producers with gourmet supermarkets, restaurants, and local seafood producers. 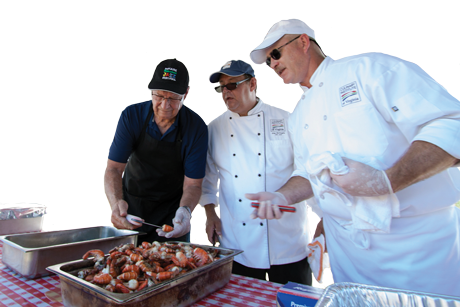 Kauffman finds that one of the best ways to connect to customers is to get them to the farm where shrimp are being raised and have an old-fashioned shrimp boil. Kauffman, along with Extension community viability specialist Martha Walker, helped Carter put on a shrimp boil, which was instrumental in helping him market his product and introduce him to new clients. Carter’s shrimp boil was a huge success. Two sittings of more than 250 people gobbled up the delicious shrimp that were grown only a few yards away. Carter said he owes part of his success to Virginia Cooperative Extension. “They were really a great partner in this entire process,” he said. 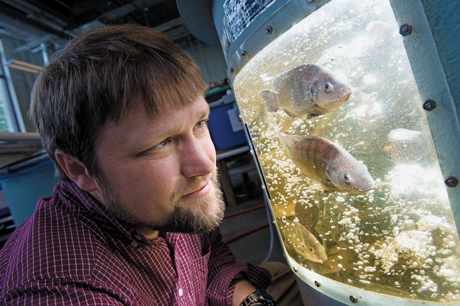 Tilapia are well-suited to Assistant Professor of Food Science and Technology David Kuhn’s research because they school well, grow rapidly, and are native to fresh water. Due to demand and population growth projections in the United States, the forecasted domestic seafood gap in 2025 is 2 million to 4 million tons, a national resource deficit second only to oil. Assistant Professor of Food Science and Technology David Kuhn is working to capitalize on this demand to strengthen the aquaculture industry in the commonwealth, and his efforts will have far-reaching impacts beyond Virginia’s borders. “In terms of a global view, fish is a good way to get protein into people’s diets,” said Kuhn. Virginia Tech: Aquaculture research from VirginiaTech on Vimeo. Finfish like tilapia are ideal for Kuhn’s purposes because they prefer to be in dense conditions, school well, grow quickly, and are native to fresh water. Tilapia is a popular seafood item among consumers in the United States, and in 2014 Americans imported 1.4 billion pounds of the fish. Kuhn’s research focuses on improving the health of farmed tilapia by increasing disease resistance and improving nutrient utilization to make tilapia higher in omega 3, like more popular marine finfish such as salmon. Because some aquaculture enthusiasts who would be interested in farming the fish have limited space for storing it, he also wants to research some ways to add value to the end product of the supply chain by not just selling whole fish, but also value-added filets. Kuhn has been working with Blue Ridge Aquaculture, in Martinsville, Virginia, to increase its production of farmed tilapia. The company is the world’s largest producer of tilapia using indoor recirculating aquaculture systems. Currently the company produces more than 4 million pounds of the fish per year.